My friend Charlie emailed me from work: “We should do a movie.” I emailed back: “RIDDICK at 8:40pm.” So off we went, two old farts in search of a bit of relief from the vagaries of consulting and attorney stuff. First we chomped down the obligatory Sushi meal at newly opened local restaurant across the street from the Old Town Trader Joe’s. Thus fortified, we drove to the theater, plopped down our money, and sat down with about 50 other people in the stadium style theater (one of 22 in this particular complex). It’s great! There’s nothing original about it, but most of the negative reviews I’ve read (and most of them are negative) concentrate of the lack of plot and Vin Diesel’s emoting. Well, I have to agree, the plot is a pastiche of many different past ideas, which will be readily familiar to anyone who has been consistently reading science fiction paperbacks. But the overall look and feel of the movie, coupled with the consistent attention to the key characters, wins the day. The overall gothic imagery of sets, costumes, and spacecraft is very well coordinated. The integration of vast matte painting views of alien landscape and architecture is expertly combined with foreground action. Characters? They held my attention. Vin Diesel - you either like him or not. I like the character he plays in this film, and I admit to being a fan of the original PITCH BLACK film which, in my view, still holds one of the most harrowing crash landings ever put to film. I enjoyed Karl Urban here, who suitably struggles with the pleading of his wife to take over leadership of the bad guys. This is as different from Eomir as you can get, and I must say I kept waiting for him to climb on a horse and lead a charge against the evil Orc army. But the real star of this movie is the look. Interior and exterior design are stunningly original for a movie this scale and echo dark and angular visual themes reminiscent of Dante’s Inferno, the original DUNE movie, Ray Harryhausen’s giant metal soldier, Giger’s ALIEN architecture, and the off-worlds of FINAL FANTASY. Two disappointments. 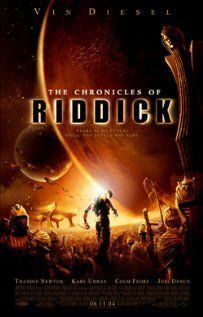 First, we don’t get to see the “Underverse.” I guess we’ll have to wait for the third Riddick movie. Second, Graeme Revell’s score is uninspired and is reminiscent of the work he did on the first DUNE TV movie. As with that soundtrack, I felt that most of the music in Chronicles is episodic, underdeveloped, and lacking in any recognizable theme or melody. But, these things aside, I enjoyed this movie and look forward to the DVD. I wouldn’t mind of seeing an extended edition on this one!. I was not as impressed the second time I saw this film, despite the addition of nearly 15 minutes of deleted material. The visuals are still stunning, and the image quality on this DVD is absolutely superb. But there comes a point in a fantasy story where the value — and need — to encrust it with more and more “backstory” becomes counterproductive. That’s what I think happened here. Making plot points make more sense isn’t really that important when the whole thing requires a total suspension of disbelief anyway, so an improved understanding of “character motivation” is only marginally helpful. That said, it is still entertaining. The extras on the DVD are interesting. We learn a lot more about the characters and the universe, but as I said, so what? The pop up text points that are displayed throughout the film do add a bit to understanding, though (a) they are too few to satisfy real curiosity and (b) some of them flash by so fast I couldn’t finish reading them. The director and actor commentary (Vin Diesel is absent) is moderately interesting. Bottom line - this is a a lovely demo of image quality, color, special effects, and alien visuals. It’s just that the story and characters don’t keep up.